The Red Bull Honda World Superbike Team heads to France’s Circuit de Nevers Magny-Cours this weekend and is targeting a return to form at the final European round of the 2018 season. After a challenging round last time out at Portimão, Leon Camier and Jake Gagne are aiming for more consistent performance on their CBR1000RR Fireblade SP2 machines in France. Camier is a fan of the French circuit and after some notable performances there in recent years, the Briton is confident of a resurgence this weekend. Gagne is also in high spirits as the American has shown strong race pace and has prior track experience of Magny-Cours after being drafted into the team for the French round last season. Magny-Cours is defined by a mix of slow hairpin corners and quicker chicanes and sweeping corners. Overtaking opportunities aren’t as widespread as at some other circuits, although the Adelaide hairpin after the very fast first sector is one prime overtaking spot. The eleventh round of the WorldSBK championship commences with Free Practice 1 at 0945 local time (GMT +2) on Friday. Race 1 will start at 1300 local time on Saturday, while Race 2 on Sunday kicks off at 1515. 2. Do not use any petrol containing more than 10% ethanol. This will cause corrosion damage to fuel system components. 3. 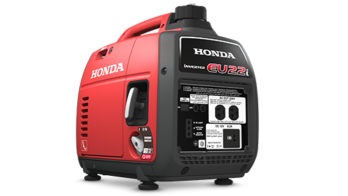 If your Honda product is used intermittently, e.g. more than 4 weeks between each use, use petrol treated with fuel stabiliser, at the time of purchase. Don’t forget that fuel stabliser has a shelf life and once opened has a shelf life of 2 years. 4. Don’t add fuel stabiliser to try reconstitute or reinvigorate stale petrol. It must be added when the petrol is fresh. 5. Store petrol for a maximum period of one month – it will deteriorate if stored for any longer. 6. 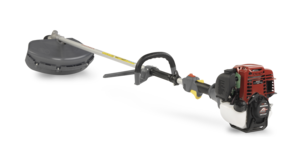 Add fuel stabiliser to petrol that is likely to be stored for any longer than one month. 7. Only use clean, sealed, approved fuel containers. These will be designed specifically to carry and store petrol. 8. If you use a steel container to store petrol, for example a jerrycan, ensure there is no corrosion on the inside of the container. 9. Store petrol in cool place away from direct sunlight. 10. Turn the fuel tap on your Honda product off when not being used. 11. Before using your Honda product check the engine oil level is correct and the air filter is clean. 12. Before winter storage, drain the petrol from the carburetor and fuel tank, referring to your owners manual on best procedure to do so. 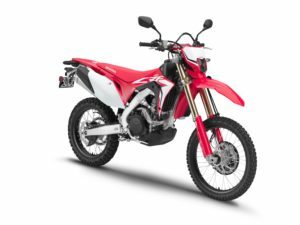 The excitement levels are high here in Honda HQ – the 2019 Honda CRF450L is set to arrive to Irish shores in October! It is unmistakably a race-bred CRF – and looks it – but with the additions and modifications needed to make it both road legal and supremely useable in a trail environment. The CRF450L is a complete package, as happy roosting trails as it is linking them up on-road. 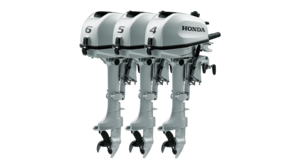 And with Honda engineering and build quality at its core, is sure to do so for years to come. A true dual-purpose motorcycle should be many things; off-road it needs to be light weight, with quality suspension and handling ability that keeps life easy as the going gets harder. 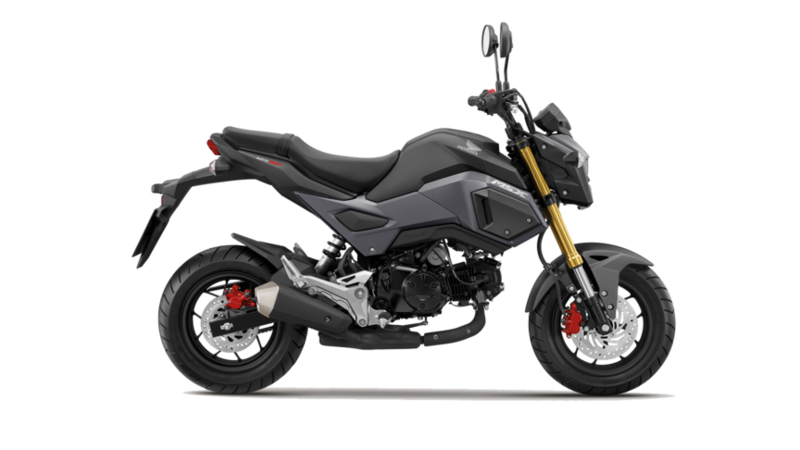 Its engine has to make good power and torque from the bottom up – the sort that is supremely usable, allowing the rider to find all the rear wheel grip possible, whatever the terrain. All the attributes that make it great fun off-road also enable it to be really useful around town; narrow and nimble, a dual-purpose machine slips through gaps, soaks up the hits from rough roads and stays well ahead of traffic thanks to smart, low-gear acceleration. It also needs to be turn-key reliable, with sensible intervals between major service work. 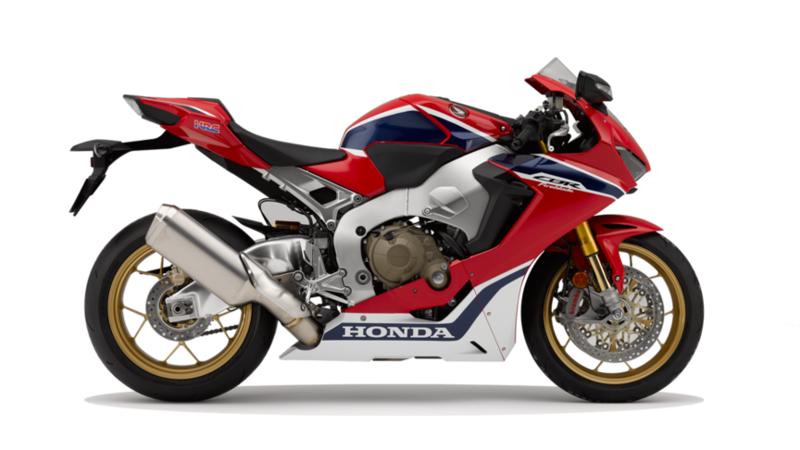 This much anticipated model will arrive to Ireland in October 2018 and will be available from your local Honda Motorcycle Dealership. Prices are currently not confirmed. On a sunny and hot Sunday at Aragon Marc Marquez took a gamble and won, choosing a soft rear tyre over a more familiar hard spec, in the end winning a fantastic three-way battle with title contender Andrea Dovizioso and Andrea Lannone and extended his Championship lead to 72 points with five races to go in the 2018 MotoGP season. Today’s brilliant success is not only Marc’s fifth at Aragon and sixth win this season, but also his 67th career victory and 41st in MotoGP, meaning that he is now tied with Mike Hailwood (41) for fourth place on the list of riders with the most GP wins with Honda, behind Jim Redman (45), Dani Pedrosa (54), and Mick Doohan (54). Dani Pedrosa took a solid result in fifth place, displaying a good pace during the entire race and finishing close to the front group. In less than two weeks the Repsol Honda Team will fly to Thailand for the first race in the Country to be held at the Buriram International Circuit. 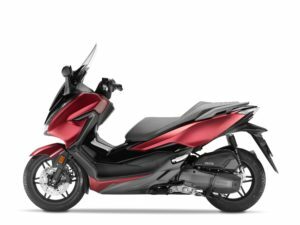 Honda Ireland are delighted to announce that the all new 2018 Forza 125 is now available in Honda Irish Motorcycle dealerships nationwide. The main ingredients in the successful Forza 125 recipe remain unchanged for 2018: a 4-valve engine that combines class-leading performance with 490km-tank range fuel efficiency and Idling Stop; a lightweight chassis that balances high speed stability with around-town manoeuvrability; and a rich specification that includes LED lights, Smart Key, two helmet storage capacity, and riding comfort for two. The production facility is also unchanged – Honda’s ultramodern factory in Atessa, Italy. But there are significant new additions to the mix. The specification and equipment rises yet another level: a new electric screen adjusts seamlessly and provides full wind protection or a stripped-down view ahead while revised instruments serve up extra information digitally, in support of the analogue dials. Both front and rear indicators are now LED, underseat storage space increases by 5.5 litres, while the Smart Key now also offers control of the optional 45-litre top box. And then there’s a new level of sophistication to the Forza’s unique aesthetic appeal. Originally designed by the same stylist responsible for the head-turning NM4 Vultus, the lines remain bold and eye-catching, but now offer an even more modern, slightly smoother, more mature appeal. The Forza 125 is priced at €5,600 and is available now. Find your closest Irish Authorised Honda Motorcycle dealership here. ‘Shorts with Sean’ Episode 4: Why Honda? In our final installment of our mini series ‘Shorts with Sean’, shot with Honda ATV Brand Ambassador Sean O’Brien, we explore why Sean chooses Honda ATV’s for work on his farm. Sean has been a Honda ATV enthusiast since he was a child and relies on the quad daily when working his family farm in Tullow, Co. Carlow. Watch below and don’t forget to visit our Facebook page to enter our latest competition to win a Ireland Rugby Top! The Honda lawnmower turns 40 in 2018 and we’re celebrating. 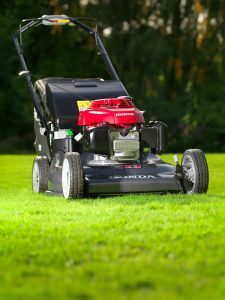 Save on your favourite Lawn & Garden products this Autumn with Honda. 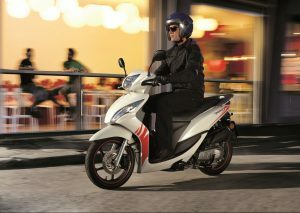 The Honda HRG536VYE was €899, and is now €799! 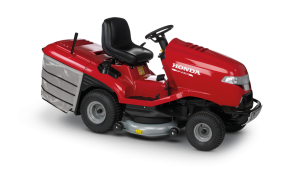 The Honda HRG536VLE was €999, and is now €899! 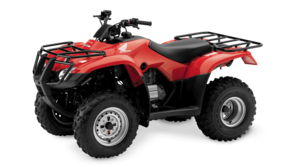 The Honda UMK425ELE was 449, and is now €349! Since 1978 we’ve been manufacturing the best name on grass. 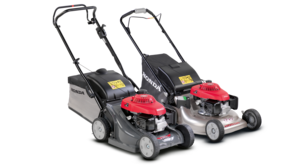 Offers can be availed of in your local Honda Lawn and Garden Dealership. 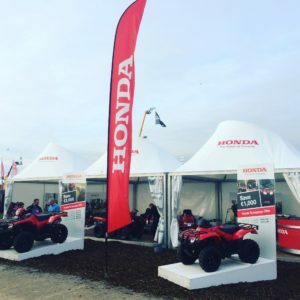 Honda’s Ploughing offer 2018 – Save €2000! The National Ploughing Championships takes place next week from the 18th – 20th of September and we are back with Honda’s Ploughing offer 2018! This year you can save €2000 on the Honda TRX500FM6, TRX500FE2 and TRX500FA6! 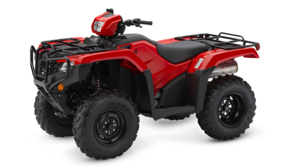 These popular ATV’s are the cream of the crop and now available for less. 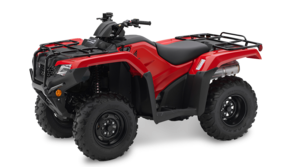 Visit us on Block 4, Row 22, Stand 486 to view the range and talk to your local Honda ATV dealer next week from the 18th – 20th of September at the National Ploughing Championships, that takes place in Screggan, Tullamore, Co. Offaly. We’ve got a treat for the Africa Twin fans out there this September! 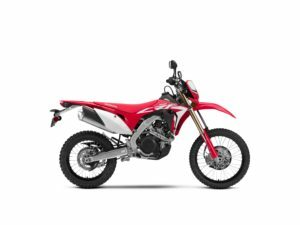 You can now get a Honda accessory pack worth €1500 free of charge when you purchase selected Honda Africa Twin models* – the Honda CRF1000AH! The Honda Africa Twin is one of our best loved Adventure motorcycles and retails at €14.500. Secure this offer by calling your local Honda Motorcycle dealer now! 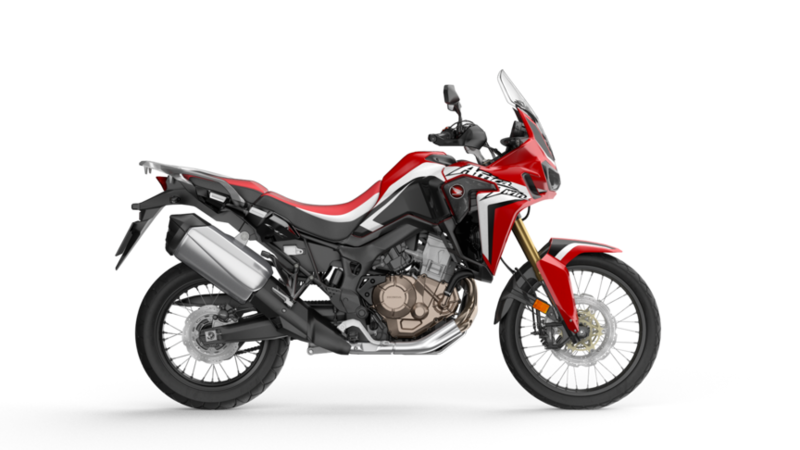 *The Honda Africa Twin model included in this promotion is the CRF1000AH is a 17YM model. Limited stock available. Offer can be withdrawn at any time and without notice. Offer only while stocks last. 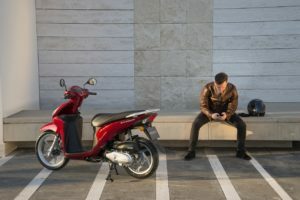 What Honda scooter is for you? 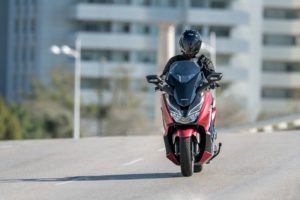 It’s a big year for the Honda Scooter range. 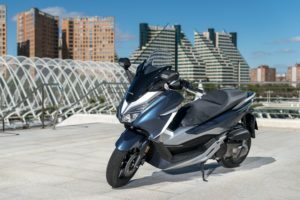 We’ve had several new additions such as the Forza 300 and the all new PCX125A launch onto the market. 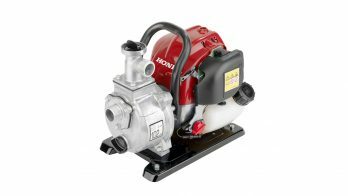 They join some of our reliable favourites such as the Vision, in both 50cc & 110cc, the Forza 125, the SH range 300i & 125i and the higher powered Integra NC750D. 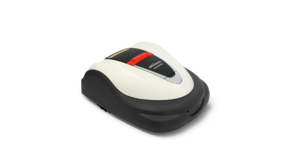 The 50cc Vision 50 is a low running cost model, that’s easy to use and run. A big plus to this model is you can drive it on your general car licence, meaning no extra IBT lessons needed. It’s got a range of 149 miles so it won’t let you down and it’s nifty for popping in and out of town. A top box is supplied FOC with the Vision 50 adding to it’s appeal. This would be perfect for you if your distance isn’t too far and you’re not interested in the IBT lessons or a higher powered scooter. 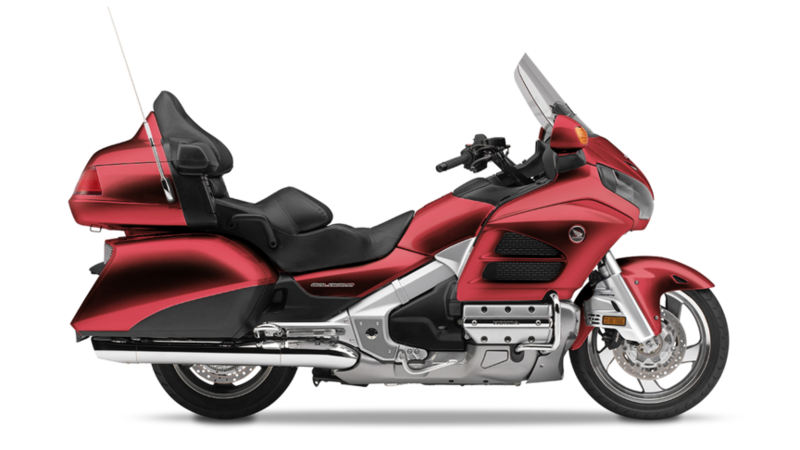 This is the Vision 50’s older brother, the Vision 110, with an upgraded engine that features idle stop and great fuel economy. It’s sleek and nimble at navigating through traffic. 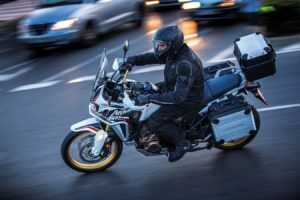 You’ll need to take your IBT lessons and do your motorcycle test to operate it, making it a great entry bike for those starting out into the motorcycle world. 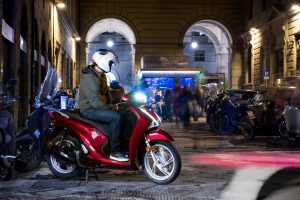 The SH125i is a stylish, comfortable scooter. 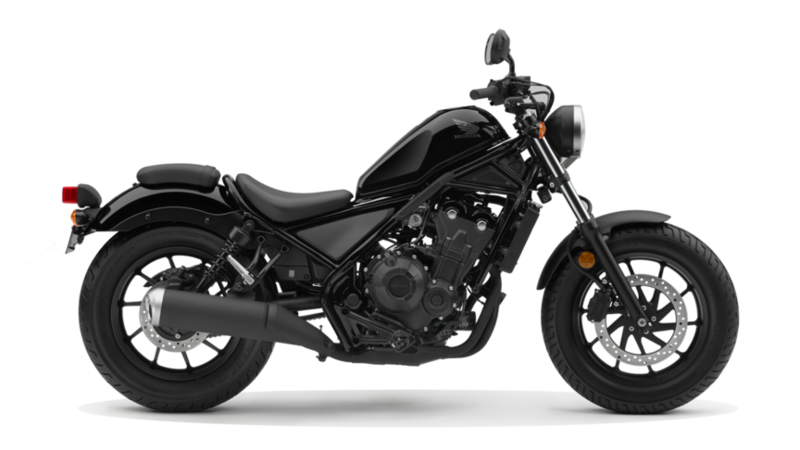 The model comes equipped with top box and screen and is another great option for those on their first foray into the world of motorcycles. It’s an ideal commuter scooter to get you around quickly and swiftly. It’s sleek style has made it a popular option with our counterparts on the continent, you’ll be sure to spot plenty if you hit any southern European city. The higher powered model in the SH range was remastered in 2016 with a sleek new look. It’s slim, light and easy to handle but it’s performance packs a good punch. It’s got large 16″ wheels to keep you steady and smooth while zipping around. A reliable model for you if you want a stylish and smooth scooter with good comfort. 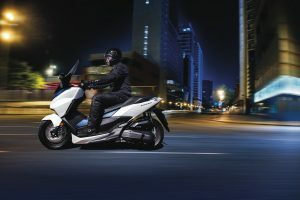 The premium Forza range are the most technologically advanced of the Honda Scooter range. 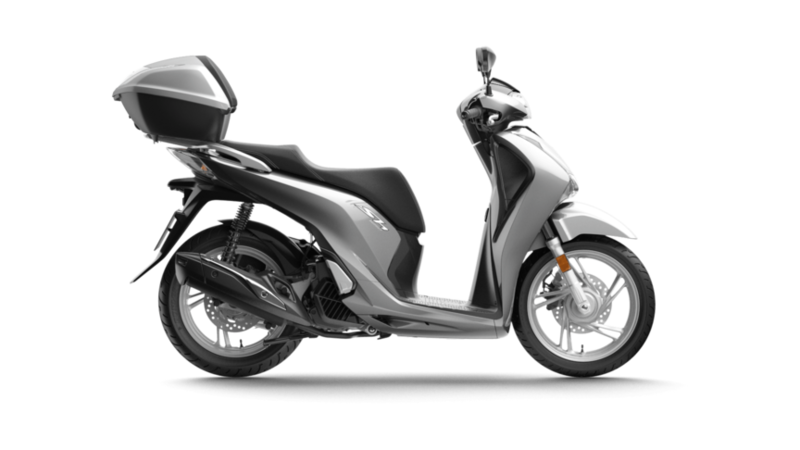 The 125 model comes with a whopping 48L of under seat storage and a Euro 4 premium engine. It’s lightweight, super stylish and you can add any number of accessories included smartphone cradles and accessories. It’s got a clear dashboard and key-less start. 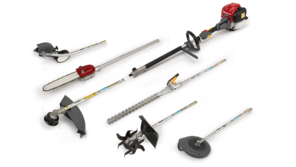 Ideal if you’re looking for the latest technology coupled with easiness of use. The 300cc model has everything the Fora 125 has plus more. 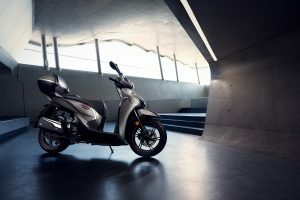 Launched in August 2018 it offers an electronically adjustable screen, full LED lighting, all-new instrumentation and Honda Selectable Torque Control (HSTC). It’s stylish, sporty and agile. The perfect bike for those early adopters who want to newest features, now. 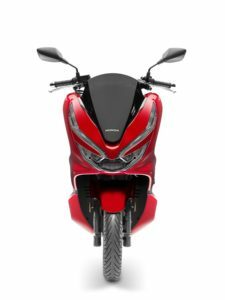 Another August 2018 release the PCX125 was remastered to be the PCX125A, It has a new frame, new design and upgraded rear suspension. It’s fuel efficient and now has ABS (Anti-lock Braking System) adding to it’s easiness to ride. It’s got LED and LCD lights & dashboard. A great scooter for those who want a scooter for both commuting and weekend trips. 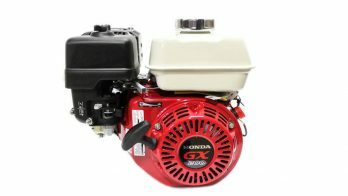 The extremely high powered Integra combines a liquid cooled 750cc engine with a slimline look. 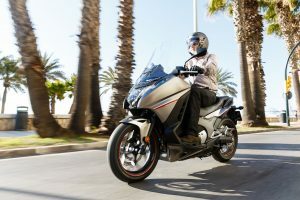 The Integra is made for those who want the ease of using a scooter but the power of a motorcycle. 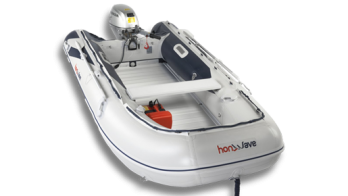 The model is comfortable and fuel efficient with easy handling. 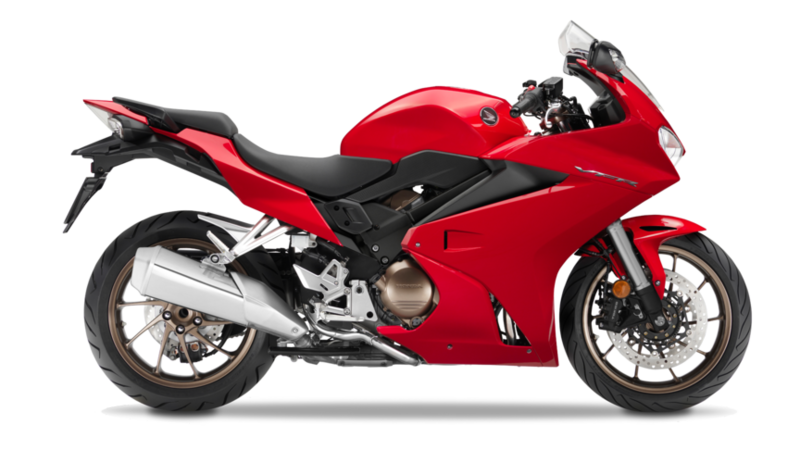 Many previously purist motorcyclists opt towards the Integra in later years for comfort, power and styling.